Ever wondered about how much gear you can fit into a camera bag? As with my other reviews, I hope to help out both with words and pictures. As the title indicates this is the second version. Crumpler bags are very popular for younger photographer's because they are more stylish (in my opinion) than the regular black square bags that most "professionals" carry. 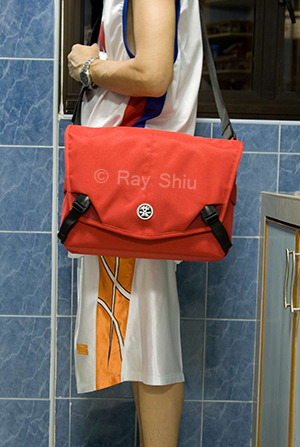 Crumpler bags come in a variety of colors. 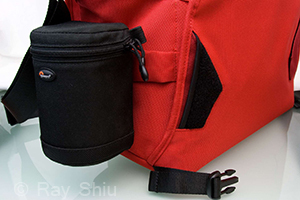 One popular opinion is that crumpler bags are "less conspicious" than the traditional camera bags. I don't really think it matters as a thief would already know which types/brands of bags carry camera equipment. Whatever you're carrying you should be mindful of your bag. Just my 2 cents. Quality wise, I am quite satisfied with the bag as it is mostly padded well EXCEPT for the top of the bag. Meaning the top portion of the flap that flips down to cover the contents of the bag. Not too big a deal for me as I don't put anything except for a jacket on top of my gear bag(s). Since this bag doesn't have a "rain cover" I'm not too sure how water resistant it is and quite frankly, I don't want to put it to the test. I'm sure the padding will soak up a lot of water before it gets to your gear. 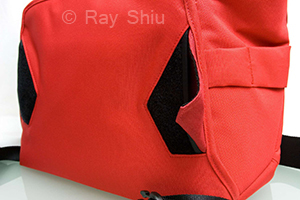 There is a front pocket which expands outwards (meaning not into the bag). As you can see in the photo it's quite sizeable. There is also a mesh pocket in there. The two pockets on either side will expand into the bag if you stuff anything in there. 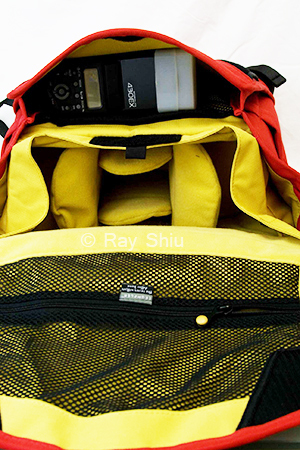 The side pockets will hold a flash gun but you will lose space in the main compartment (where your camera would go). A mesh pocket also lines the main flap. These extra little pockets allow room for filters and or personal items such as keys, wallets and other everyday carried things. Making this bag ideal for the minimalist street shooter. Since I'm using this bag primarily as a walk around bag where I'll need to get to my gear quick (as opposed to my backpack style bags), I only have 2 compartments. the big one holds my camera (same configurations as above). Right below it is 2 gadget "cases/bags" one for cleaning stuff and the other for extra batteries, wireless remotes, extra CF cards etc. In the smaller compartment is my flash with diffuser attached and a second lens with lens hood reverse attached (70-300 IS USM pictured). Under the flash is a 50 f1.8 II. If you wanted you could put it on top of the other lens. This is what it looks like when I release the flap and look down at the bag while it's on my shoulder. The difference between the two is that the first one has only one buckle in the middle to secure the flag. In the inside of the flag, behind the buckle is a large velcro patch. As you know, the more velcro the noisier it gets when opening. So this second version has 2 buckles (one at each bottom corner) and smaller patches of velcro behind the buckle. To "silence" the velcro, there is a small flap that you can put over the velcro, rendering it inoperable, so no more noise. In this photo, the black is the velcro, the darker red part extending into the black area is the flap 1/2 way pulled out of the pocket behind the velcro. This flap will fully cover the velcro. 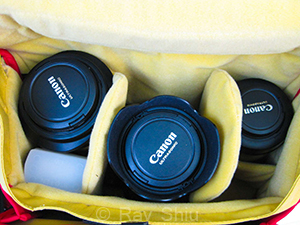 In this photo, I have a Canon 400D with Battery grip and 24-105L (hood on) stuffed into the middle "compartment". To the left is an EFS 10-22 (hood reverse mounted) and a 430 EX flash with stofen diffuser attached. To the right of the middle compartment is a 70-300 IS USM with hood reverse mounted. The space left over will not fit another lens unless both lenses going into that section do not have hoods attached. The green (rounded) dividers separating the compartments can flip down so if you don't like your camera's lcd sitting on the bottom of the bag, you can put your camera (lens facing down) so that the body is supported by the dividers (when the flaps are folded down). 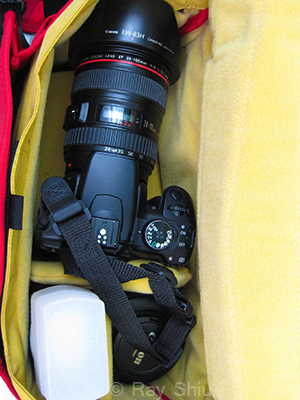 On either side of the bag are loops from which you can attach things like lens cases. The Lowepro ones will fit snugly whereas the Tamrac ones won't fit, you'll have to squeeze them in. In this photo it looks like there's room to spare in the loop but that's no the case. The loop you see is actually a second one because the whole loop is stitched in the middle. The loops will fit a Gorilla pod leg or a monopod. The shoulder strap comes with a shoulder pad, is adjustable and does not detach. 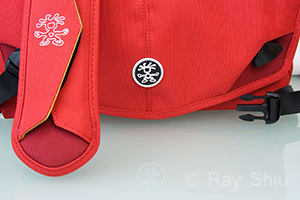 1) The shoulder pad on the strap is basically useless except to add another place Crumpler can put a logo on. There's no padding to speak well of, it does match the bag color tho, breaking up the black strap to add a bit more "fashion" to the bag. 2) The loops to the side of the bag although will fit a monopod/gorilla pod leg, it would have been REALLY awesome if it were big enough to fit the belt fastener system of a flash pouch or a filter pouch. 3) The buckles for the front flap are adjustable in length but not by a lot. Admittedly, it has taken me about a year to decide if I really needed a sling style camera bag. After much debate, I decided to get one and having searched around only Crumpler made one that I liked. This bag is certainly well made but it is also a bit price for its' size. It's more expensive than my Slingshot 200 AW and a bit cheaper than my Computrekker AW. After fiddling with the dividers at home with the gear I intend to take on daily walk arounds, I'm liking it more than at the store when I only had my camera and lens. It fits all I need it to nothing more, nothing less (I've got bags for those occasions), it's made well and looks good. Just walking around at home taking gear in and out, it feels quick and convenient.